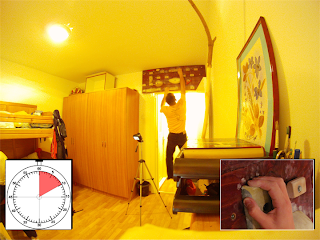 Some years ago I had found an article on how to train on your fingerboard which was divided into three sections: warm-up, intermediate and hard. The article, and the graphics were available on IndoorClimbing.com but for some reason I couldn't find them anymore. 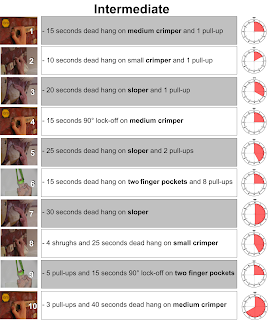 I still visit the site and I believe it's a great resource for training tips when it comes to climbing and bouldering. They have some good articles about nutrition as well. Since I couldn't find the original training schemes I figured I can design my own workout, similar with what was then posted on the above mentioned website. Mine is a bit easier (?) and it's rather targeted for beginner and intermediate athletes. Update: Some tasks in the advanced set are hard to finish... So let me rephrase: These training sets are for intermediate and advanced climbers! However, if you are a beginner you can do only the warm-up set a few times. Looking for harder and more complex stuff? Take a look at the Metolius training guide. Shrugs - When doing shrugs you basically hang on your board (arms stretched) and move your body up and down from your shoulders as when starting to make pull-ups. This exercise works your back muscles and it copies the climbing situation for a long reach. Offset pull-ups - You hang on holds which are either different (sloper and crimper) or are situated at different levels on the board (bottom jug and top edge). Lock-offs - Keep yourself in place hanging with your arms bent at a certain angle (90° for example). L-sit - see the picture. Raise your legs to a 90° angle with your upper body, all while hanging on good holds. Concentrate on your weakness - If you have a hard time holding onto crimpers then build your training around this type of holds. Do not exaggerate with crimpers as you may injure your fingers (tendons) faster than with other holds. Adopt the open hand - It's been proven that training with an open hand (and open mind) will increase your crimp power whereas vice verse is not true. Another reason for keeping your hand open is because this is normally a weakness for everybody - the usual way of holding onto something is grasping with full hands. An open hand capability will lead to better endurance as well. Build strength gradually - You don't need to be champion at fingerboarding... Keep your training within reasonable limits and give your body time to recover. If you feel pain in your limbs or fingers then slow down and treat yourself - massage, sleep, sport balms, etc. Over-training is silly so don't do it! Stretching - A pumped and fatigued muscle should always be stretched after a strenuous effort. Always stretch and massage your forearm muscles (as well as deltoids, biceps, etc) - the lactic acid will be dissipated faster and your aerobic capacity will improve. Stretching is the first act of recovery after exercising. Eat carbohydrates - Your body will refill its glycogen reserves faster if you eat carbs within an hour after your ended your training. As an athlete, you may want to be able to perform again, over and over, so you have to reconsider your eating habits in order to consolidate your training. Details + Mindset = Success - Doing all the above and many other small things that work for yourself will ultimately make you a better climber and a better sportsman. I get best results when I combine diet, specific climbing training, cross fiber massage (elbow joint) and aerobic sports (cycling and swimming). But I'm not sure if the outcome is generated by all these factors or by my brain... I normally gain confidence and I climb better if all the physical aspects of training are covered - so I guess your psyche improves with physical input. Get a wall clock - with arrow-hand for seconds - and have it placed in front of you, so you can see it while hanging on your board. 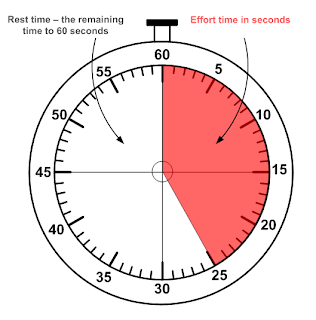 Print the training schemes and place them below your wall clock for quick reference. Each set lasts 10 minutes with a 5 minutes break between them. Use the rest time within each minute for shaking and chalking. Your workout should last about 1 or 1.5 hours, thus you can repeat the intermediate or advanced session. Drink plenty of water during your training - 1 or 2 liters will do. Your muscles and sinews perform to full power only when you are fully hydrated. Do some stretching at the end. That's it for now. I'll be adding more hangboard training exercises in the near future but remember that you can always improvise as you see fit for yourself. As soon as you find something that works for you, stick to it and keep improving. Train hard and stay motivated! Interesting sets, although I think they are way to hard for a beginner... (anything up to 6b-6b+ personal best...). Even for a 6b-6c I think you warm-up is tough. After several injuries to climbers at my gym working on the hangboard i want to stress to any beginner! ; really start slowly and stick with it for a good while (2-3months) without progressing in difficulty... You'll receive so much more reward in the long run, if you take it slowly in the beginning... and also work your pushing muscles at the same time with medium intensity. You may be right... I guess for a true beginner these sets are hard. 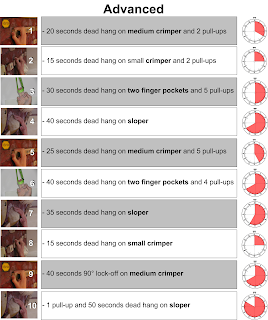 Good point about starting slowly with hangboard training.